Sunday and I, we used to not be friends. The last bastion against the dreaded return to work, Sunday used to pop its little head out shortly after midnight on Saturday and then continue to poke and prod me with its annoying little finger, a relentless reminder that the office was beckoning and my fun was coming to an end. Not anymore. Well, not for the next 20 weeks at least, not when the NFL season is in full flow. From today until the 3rd of February I live for 6pm on a Sunday night, when I can churn out some quality eats, crack open a beer or two and sit back to watch my Chicago Bears conspire to send me to an early grave. And if the Bears won't do it, these tasty morsels are sure going to try. You want cheese-stuffed peppers wrapped in bacon? I give you, jalapeno poppers. Start with about a dozen fresh jalapeno peppers. These are usually a bit more plump than regular green chilies and have a slightly milder heat - something you might be thankful for later when you're biting into a whole one. Chop off the tops and scoop out the seeds and guts. Anything goes with the filling, so cram it with whatever flavours you fancy. I mixed some cream cheese (full fat, anything else is a sin) with chopped spring onions and coriander, a squeeze of lime and S&P. It can be a tricky business making sure the peppers are completely filled but I found that the small end of a teaspoon worked a treat. You can have that one for free. Because, bacon. Wrap a rasher around the top of the pepper, making sure to form a seal over the hole so that the filling doesn't melt out. Use a toothpick to secure the bacon in place, otherwise when it cooks it will shrink in size and pop right off. And then everyone laughs at you and your stupid, stupid bacon-less food. Hot oven for about 20 minutes, job done. Thems are gonna be hot as hell so allow to cool for a couple of minutes before shoving in your mouth. 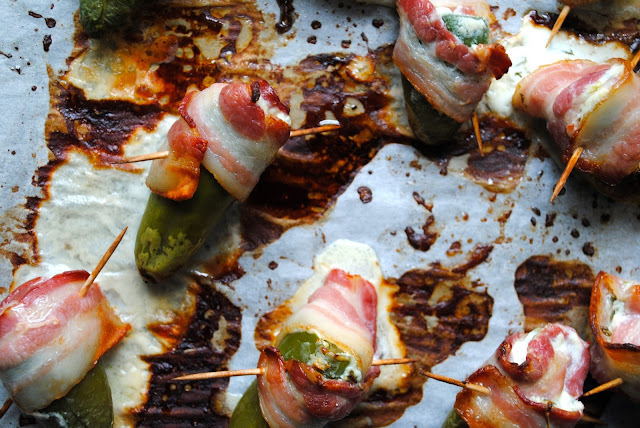 And there you have it; bacon-covered, cheese-filled, spicy jalapeno poppers. Man I LOVE Sundays. I recently saw deep fried jalapenos, these look much more my style. I'm going to do these tomorrow with halloumi wrapped in blankets too. HOW has this blog not got more comments? It's great! Hey thank you so much! How did the halloumi poppers work out? They sound delicious. Really appreciate your kind comments, I love doing the blog so it's great to hear that people enjoy my work. Spread the word!